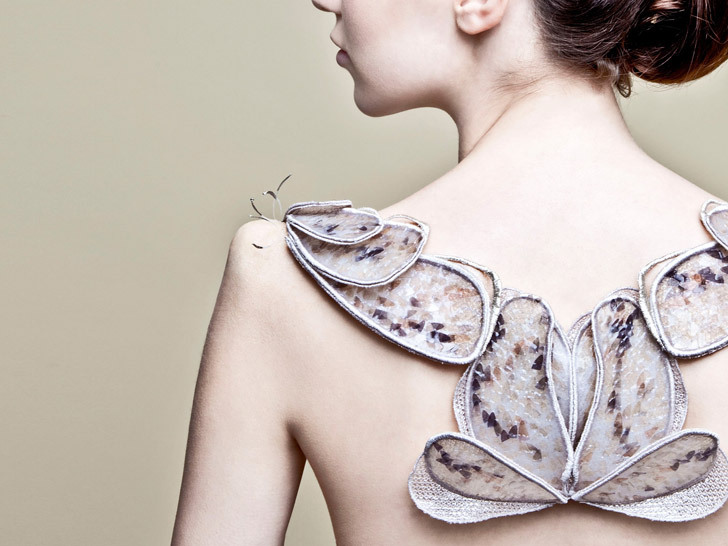 Amy Congdon envisions a future where we can grow bespoke "biological textiles"—ethical ivory, say, or a cruelty-free cross-species fur—with little more than cell samples and a petri dish. The London-based designer, a graduate of the Textile Futures program at Central Saint Martins College of Art and Design, has just embarked on a three-month residency at SymbioticA in Perth, Australia, where she'll explore the role biotechnology can play in ushering a new breed of luxury, renewable materials. Congdon specializes in digital embroidery, a technique used to manufacture textile-based surgical implants. After researching burgeoning technologies such as bio-inkjet printing, which uses an inkjet device to print “bio-ink” patterns for growing biological tissue, her interest was piqued. “At some point in the not-too-distant future, biotechnology is going to give the design world the biggest set of completely new materials and tools it has ever had the opportunity to play with,” she says. With Congdon’s “biological atelier,” she imagines a workshop, circa 2082, where couture is fashioned not from fabric but from cells. And with networks such as DIYbio and BioBricks to support growing amateur-biology literacy, that future could even be tomorrow. “Projects like BioBricks, which is a growing library of biological parts or bits of DNA for use in synthetic biology, point to a future of biological materials readily available for use in creating products,” she adds. But first, she has to work within the constraints of 2011 technology: producing embroidery scaffolds on which cell lines can grow. And after that? We can only imagine. Congdon specializes in digital embroidery, a technique used to manufacture textile-based surgical implants. After researching burgeoning technologies such as bio-inkjet printing, which uses an inkjet device to print "bio-ink" patterns for growing biological tissue, her interest was piqued. "At some point in the not-too-distant future, biotechnology is going to give the design world the biggest set of completely new materials and tools it has ever had the opportunity to play with," she says. And with networks such as DIYbio and BioBricks to support growing amateur-biology literacy, that future could even be tomorrow. "Projects like BioBricks, which is a growing library of biological parts or bits of DNA for use in synthetic biology, point to a future of biological materials readily available for use in creating products," she adds. With Congdon's "biological atelier," she imagines a workshop, circa 2082, where couture is fashioned not from fabric but from cells. "What new material hybrids can we expect?" she asks. "With one of the most controversial sets of materials becoming available for manipulation—i.e., our body, and those of other species—will future fashion be grown from the ultimate commodity?"